You can adjust the brightness of the display and control the volume of a sound signal in order to increase the battery life. The appliance might seem rather heavy. 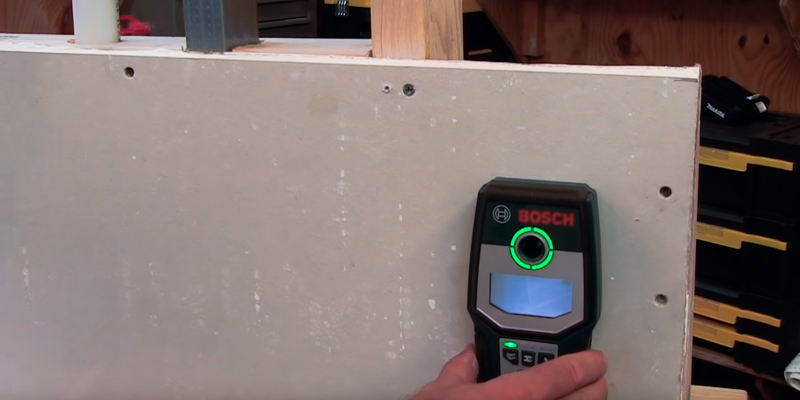 The stud finder from Bosch is a true must-have for both constructors and hobbyists as it shows every item behind the wall 4-3/4'' deep. Having detected a stud or wiring, the tool alerts a user about it via an illuminated ring, audible alert, and a picture on a display. Switching between the available operating modes, you will always be able to find out the depth a stud is located at. The display doesn't feature a backlight. 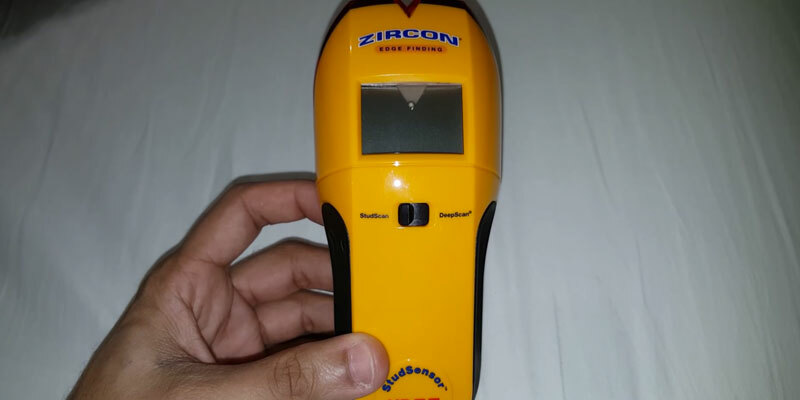 The Zircon e50 is the best option for those who use a stud finder to detect hidden objects on a daily basis but don't want to spend a fortune on some super hi-tech tool. Just a couple of buttons and a stud is found! Any user will appreciate a small weight and a compact size of this tool. Thus, it will snugly fit into a pocket of your shirt or trousers. 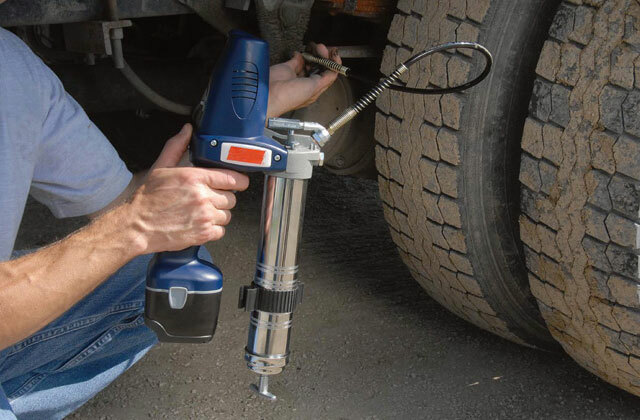 Equipped with two rare earth magnets, the tool is the most durable model that copes with the task twice as fast as most of the other stud finders. Perfect for detecting hidden objects behind drywalls and locating vertical studs owing to the onboard level. The auto shut-off function automatically turns the device off after 3 minutes of no use, saving on batteries. The maximum detection depth stretches up to 6 centimetres. The instruction manual is written in a relatively difficult technical language. The Homder TH231 will prove useful for people from all walks of life. 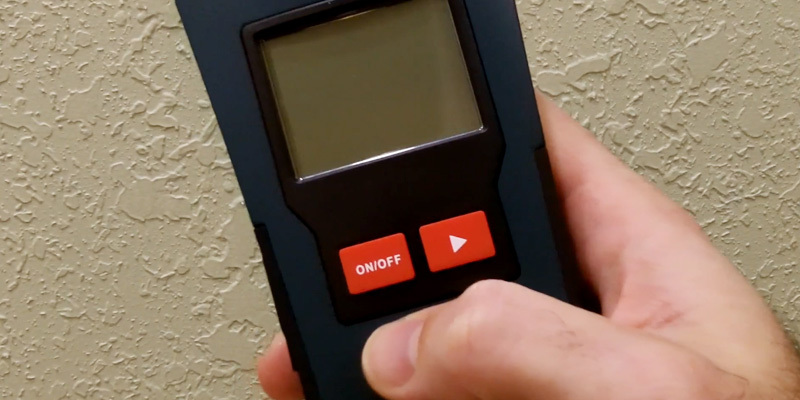 It's a budget stud finder that is perfectly suitable for professionals, DIY enthusiasts, and inexperienced people alike. In spite of how easy it is to use, the model is no less effective than most high-end finders. 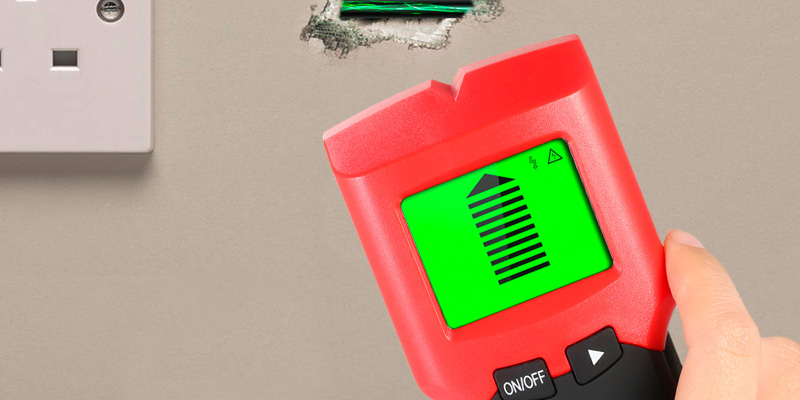 The stud finder comes equipped with four modes: stud mode, metal mode, AC mode, and deep mode. On top of that, you receive a low battery indicator and an auto-off feature that activates after 60 seconds of no use. The metal mode could use some improvement in terms of accuracy. Fetanten 4-in-1 Digital Multi-function stands by its name as one of the most versatile options on the market. On top of that, it is also incredibly easy to operate, making it an exceptional choice for a large variety of potential customers. 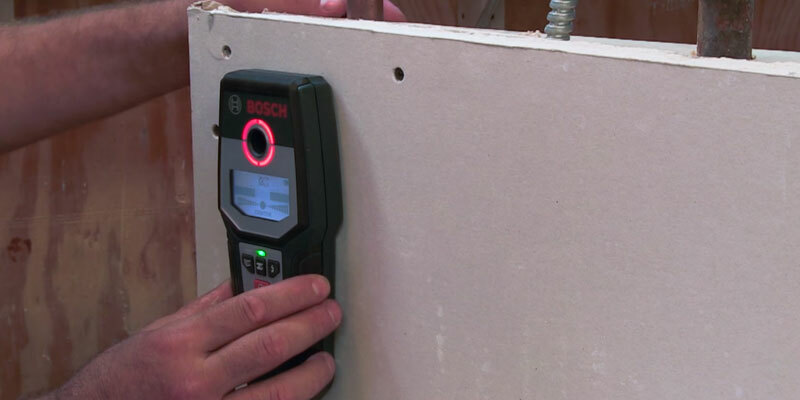 The first item in our review is a stud finder by Bosch with its exterior being the first aspect examined. The device comes in the housing made of standard dark blue plastic, has an easy-to-read display and six control buttons on its front side. However, the first design element that drew our attention was a circular shape port with four LEDs on its perimeter placed right above the display. The purpose of the LEDs is to inform you about in-wall objects being in proximity to the finder and the port allowing you to put a mark on the wall. Though these LEDs double the device scale in indicating the presence of nearby objects inside the wall, they may come in handy for users suffering from a weak sight as the LEDs enable them to see the direction to a nearby object sought even without their glasses on. The only element on the Bosch GMS120 back is the battery compartment cover. Though the model uses a single 17R8H battery for its operation, it is comparatively bulky and on the heavy side, which is justified by the finder rich functionality. 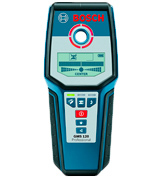 The Bosch GMS120 can be used for detecting wood and metal beams and columns as well as nonferrous metal elements and electric wiring. You can select a corresponding detection mode by pressing the dedicated button on the device. Please note that each mode has its own maximum scanning depth. For example, the GMS120 can detect ferrous metal at the depth of up to 4-3/4 inches, nonferrous metals – at up to 3-1/8 inches, the wiring - at 2 inches maximum, and the wood elements – at 1-1/2 inches. 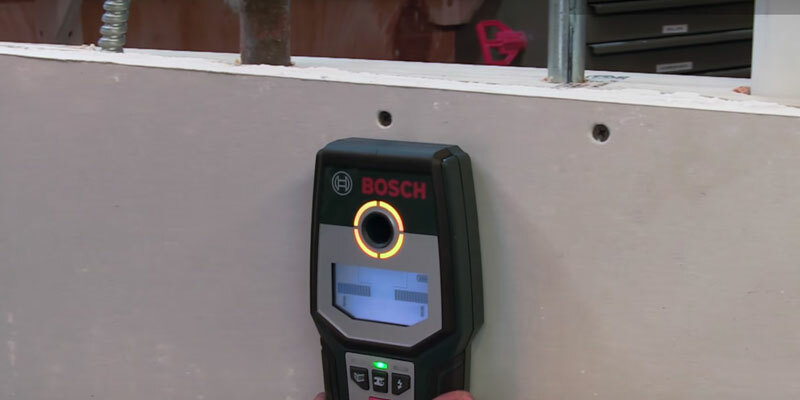 This Bosch stud finder will notify you about objects detected in two ways: by means of a sound signal and LED flashing. As the device approaches an in-wall object, its built-in LED changes its colour from green to yellow and eventually to red when the object gets close to the device. Thus, in addition to the visual indication of the scanning progress, you are notified about a nearby in-wall object by beeping signals. However, you can turn the beeping notification off any moment by pressing the key. Speaking of additional features, one of the things that seem especially convenient for us is a display of the tool, featuring a backlight that can be turned on and off any moment. We also found out that the Bosch GMS120 automatically turns off after about 5 minutes of inactivity, which also adds to its usability features and prolongs its battery life. 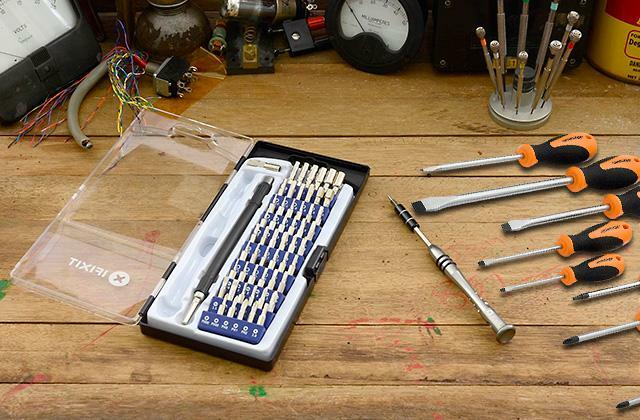 For ease of use, the kit includes a hand strap that will allow you to carry the tool in a similar manner you normally wear a bundle of keys, and for safe transportation - the kit contains a carrying case. Considering all of this, such a detector can be advised to those who often use such kind of devices, in particular - for the duty of service. 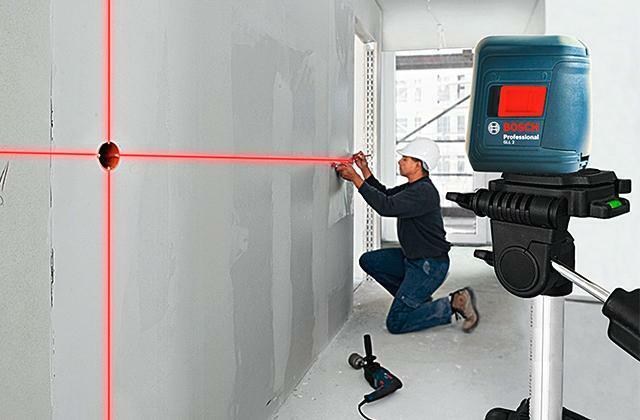 The Bosch GMS120 will be an excellent solution that will quickly find and maximally show objects hidden in walls. Wouldn't Go Amiss for Sure! When examining the device, we were a little surprised that its case is protected against dust and water splashes in conformance with the IP54 standard. But taking into account that the device can be used outdoors, the availability of such protection would surely not go amiss as it improves the device reliability and prolongs its service life. The next entry in our review is a finder by the Zircon company, which was founded back in 1975. The company started as a digital watches manufacturer and decided to apply its experience in high-precision products making to stud finders production. 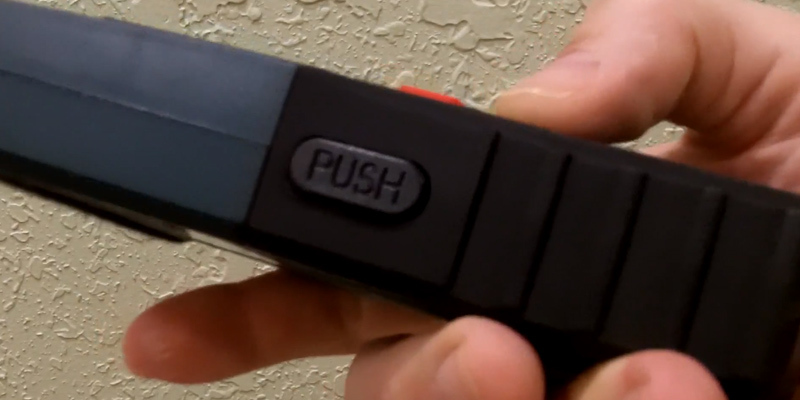 That led to the emergence of the StudSensor™ finders line, one the models from which we examine today. 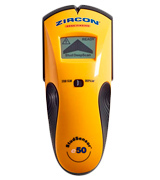 The Zircon е50 model uses electric sensors and a nine-volt battery as a power source. The e50 has a plastic case with two soft cloth inserts at the bottom that ensure its smooth sweeping across the wall and prevent any damage to the wall finish. There is also an ergonomic rubber insert over the molded grip on the lower end of the device case for more convenience. As for the controls, the finder face has only one two-position switch and the power on button on the left. To help you figure out whether the device is that simple to use we will describe our experience with it. In regard to the finder functionality, we can say that the model can pinpoint the location of wooden racks and structures, metal profiles, as well as wiring and metalware. 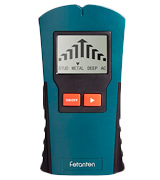 This detector operates in the Stud Scan and Deepscan modes. When used in the first mode, the device detects wood and metal objects at the maximum depth of 3/4 inches, which is actually needed for the search for profiles and racks. Switching to the second mode enables the detection of the same objects at the depth of up to 1-1/2 inches. With that, live wires in walls are detected automatically in both modes at a depth of 2 inches. 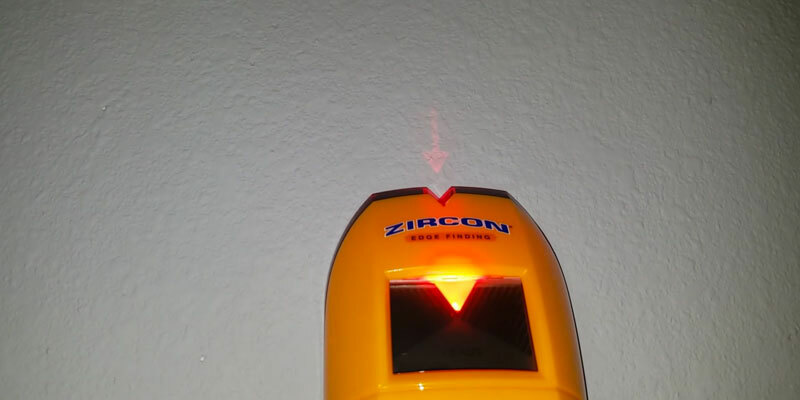 On live wire detection, the Zircon e50 notifies you about that by flashing the corresponding indicator on its display. In addition, any detection of the above objects is accompanied by an audible signal, which is very convenient as you won't need to constantly look at the display and will be able to focus on the layout of the objects in the wall instead. So after selecting the suitable mode and taking the device in your hands, you can start to operate the device in a blind mode right away as the scan initiation button is easy to find and push. Easy and convenient, isn't it? Among the noticeable features the device offers, we want to write about the finderability to accurately pinpoint objects edges location. That is, when sweepingthe e50 across the wall from right to left, you can first locate the right edge of an object and after sweeping in reverse direction the device pinpoints the left edge of the object. Having marked the edges, you will easily find the center of the object, where you can drive the screw or drill a hole in. 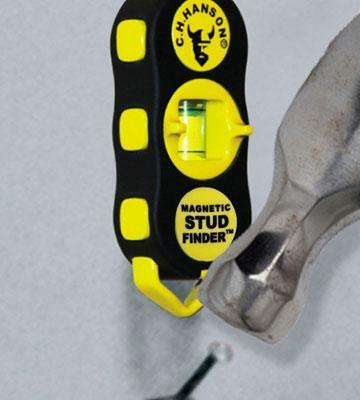 For your convenience, the stud finder handle is made with ergonomic finger indents to fit snugly in your palm. Now, a few words about the scan button positioning. As we mentioned earlier, the manufacturer placed the button on the device left, just where you put your thumb when you take the Zircon e50 in your right hand. Thus, after a short use, you will already be able to start objects detectionwithout even looking at the device. In general, the e50 model is a nice choice for those who want to always have a reliable device at their fingertips that can quickly and accurately detect not only wooden and metal parts and structures but also concealed wiring. By sweeping the finder across the wall, you can quickly locate in-wall objects. After the device’s detected an object all you need to do is to mark its location on the wall, which is very easy with the special mark on the device top that the manufacturer providently provided for. 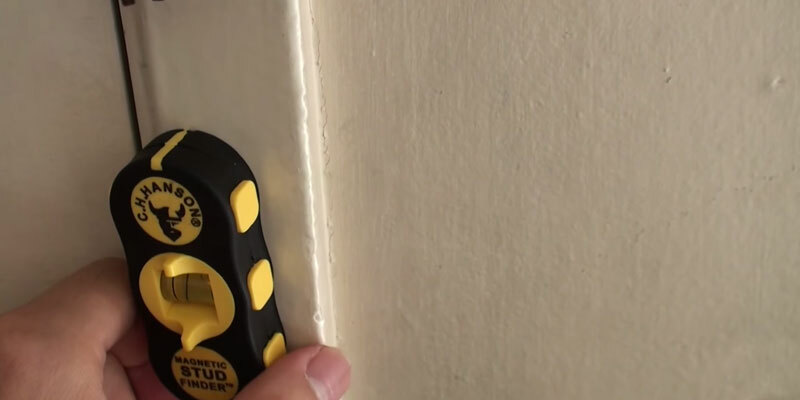 Now we want to bring to your attention a stud finder that uses magnets. The CH Hanson 03040 device has a rather simplistic design with no display or buttons and all it's got is a bubble tube in the centre which also doubles as a levelling gauge. The 03040 finder is very compact and weighs as little as 2.4 ounces. Thanks to this, you can carry it easily in a pocket of your shirt or trousers, unlike many competing products that require proper fixation to the hand wrist or a belt. However, small dimensions aren't the only advantage of the tool. 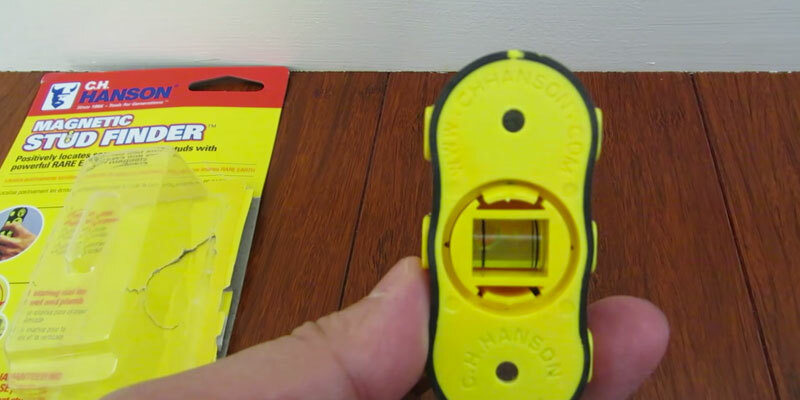 One of the other benefits of the CH Hanson 03040 stud finder is that it features a power independent design. Let's see into its operation a bit closer. The finder uses two rare-earth magnets to locate hidden objects in walls. 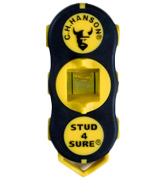 Indeed, the CH Hanson stud finder is a rather easy-to-use and straightforward tool with a simple design. Just place the finder on a wall surface and sweep it across the wall in an S-shaped pattern until you feel the device magnet attract to a hidden object, which indicates you’ve found the object location. What's more, you can leave the CH Hanson 03040 hanging on the wall until you ready a marker or a pencil to mark the metal object location. However, you can start drilling or driving self-tapping screws in some place under or above the located object as the beam it is attached to goes vertically across the wall. Moreover, this tool is equipped with a levelling gauge, thus after finding metal objects you can use the tool to draw horizontal lines across the objects detected and mark the positions of horizontal beams. As for the downsides of this model, it offers a comparatively small detection depth, which is 3/4 inches. Though using the finder you will have no problems in finding a structural iron in a drywall. Now let's consider in detail the additional convenience feature of the device, which we mentioned above. To get the most out of the free space available in the detector case, the manufacturer decided to build in yet another, quite useful device - a two-direction bulb level. Using the magnets and the level, you can locate metal objects in the wall and mark the horizontals and verticals on which the objects are positioned right away. Thus, the device will be of a great use when you locate in-wall metal profiles because once you get the finder attracted the wall just follow the level and mark the necessary points. By the way, we found out that due to the simplicity of its design, this device is not covered by manufacturer's warranty, so do not be surprised if the seller does not provide you with any as the CH Hanson 03040 has simply nothing to break. For your convenience, this CH Hanson model is equipped with a plastic loop, which allows you to hang the device on the wall in your workshop. This small feature is very useful as the compact size of the finder makes it easy to get lost among other tools. Thus, hanging it on the wall you will always know where to find it. Considering the price tag that it comes with, the Homder TH231 has quite a lot going for it. Advertised as a multifunctional, 3-in-1 device, this little tool will help you detect a variety of invisible objects. 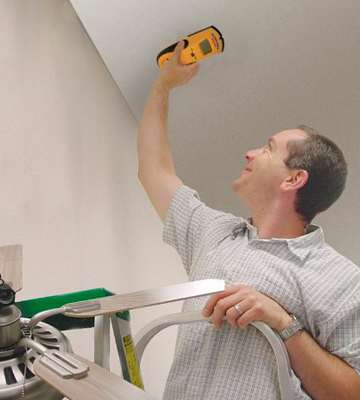 Of course, just like any other stud finder, the model will help you find wood studs. But, in addition to it, it will also locate metal objects up to 2.36" (60mm) and live unshielded AC wires all the way up to 2" (51mm). 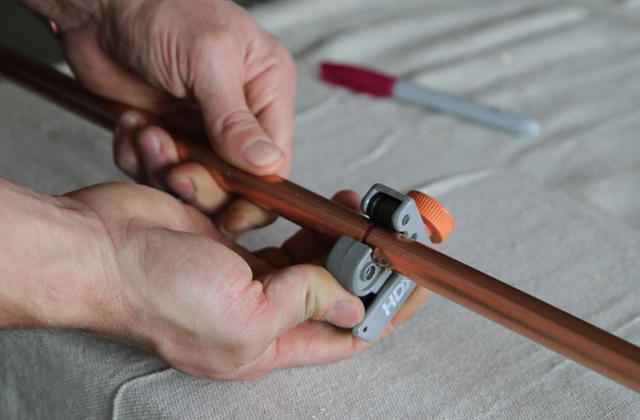 Thanks to its efforts, you won't accidentally drip into a water pipe or a wire hidden somewhere within your walls. As you'd imagine, it makes the tool invaluable for a variety of refurbishment projects, from hanging paints to installing all kinds of wall ornaments. 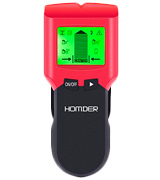 As all stud finders go, the Homder TH231 will prove useful for people from all walks of life. Just about any homeowner could benefit from it. 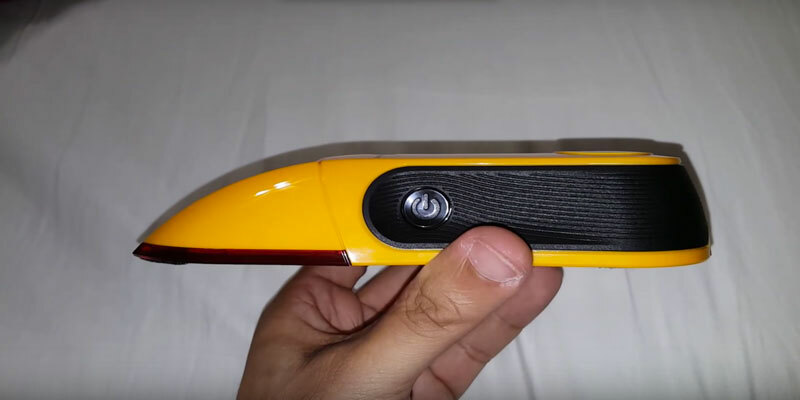 Plumbers, masons, electricians, carpenters, and people of other similar professions couldn't do without a stud finder in general and wouldn't want to settle for anything short of this model in particular. Having said all of that, what is it exactly that separates this model from the rest of its competition? Well, not much, if you compare it to some of its more expensive counterparts. But, as we've said earlier, this is a budget model and, for a budget model, it is a pretty darn good gadget. Its maximum detention depth stretches up to 6 centimetres, a number that even a solid chunk of high-end finders fail to replicate. Of course, as some of you may know, that sensing depth and the finder's accuracy depend on moisture, the content of materials, the quality and quantity of paint, as well as the texture of the wall. But that is true for all stud finders and not this specific device in particular. Aside from depth, the gadget's design is also deserving of a little praise. The streamlined handle will make it easier and a tad more convenient for you to hold the device as you scan across the wall. It features only 3 buttons. When it detects something, the model beeps and displays its "find" on the screen. With the mode button, you'll be able to switch between the Studs, Metal, and AC Wire modes. The green backlighting makes the display and its measurements clearly visible in low-light conditions. 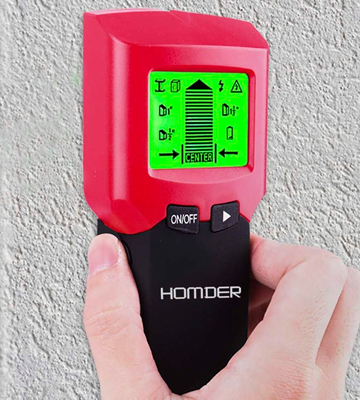 To sum it all up, the Homder TH231 is a budget stud finder that is perfectly suitable for professionals, DIY enthusiasts, and inexperienced people alike. In spite of how easy it is to use, the model is no less effective than most high-end finders. The auto shut-off function will automatically turn the device off after 3 minutes of no use, saving on batteries. The company behind this device markets it as a 4-in-1 Wall Multi-Scanner Electronic Stud Sensor. So, naturally, with a name like that, the biggest emphasis has got to be put on the multifunctionality and versatility of this model. 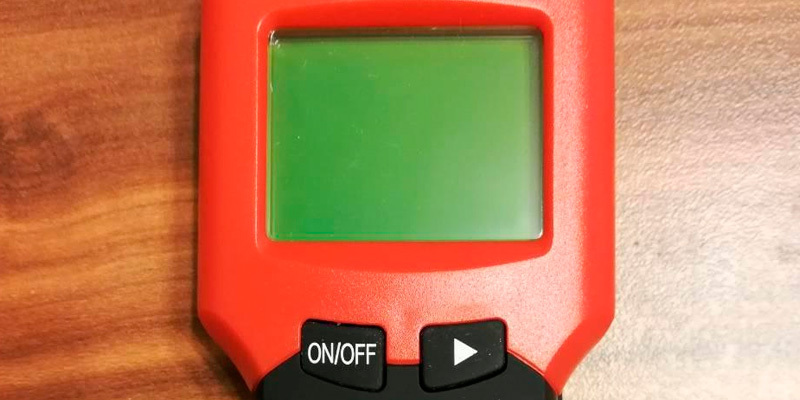 After all, regardless of how well your device is equipped against a certain kind of issue or towards a specific task, if it isn't capable of handling a large variety of assignments, you can't really, in good faith, call it a multifunctional stud finder. And, upon further inspection, we can tell that the model in question truly deserves this kind of title. First of all, before even discussing all of the modes this product is equipped with, we would like to point out that the aforementioned stud finder is one of the faster and more precise options on the market and it is more than capable of effortlessly and quickly locating edges and centre of stud finder metal studs, pipes, wooden beams, rebar, current behind walls, floors and ceilings, not to mention the fact that it can also indicate the presence of live AC wire. Although the device cannot be used for direct current, the possible number of applications is impressive nonetheless. Now, as one could rather easily infer from the name of the device or, more specifically, from the part of that name that says "4-in-1", the model is equipped with four modes: stud mode, metal mode, AC mode, and deep mode. Without going into too many details, we would like to briefly touch upon every single one of them, including their purposes and capabilities. The stud mode is there in order to find the edges and the centre of a wood beam in walls up to 1.2 inches (3 centimetres) deep. 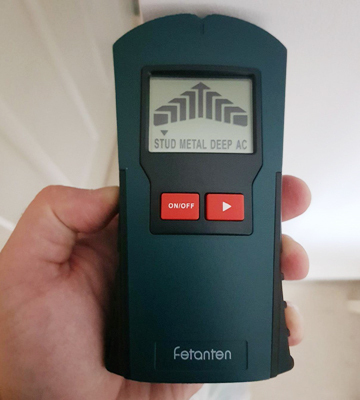 The metal mode doesn't stray too far away from its name and is included in the model with the purpose of detecting metal, such as pipe, rebar, copper, and aluminum in walls up to 1.57 inches (4 cm). 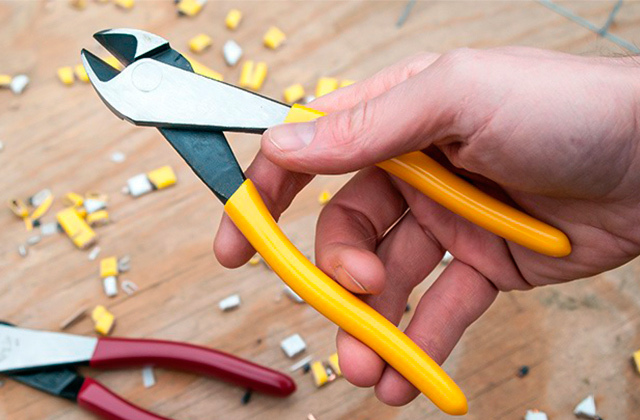 The AC mode, also known as a Current mode, does a perfectly acceptable job when it comes to locating live AC wire lines up to 2.36 inches (6 cm) deep. And, last but not least, there's the Deep mode that is put there in order to identify and determine the depth of the wall. The said mode is capable of doing so in walls up to 1.77 inches (4.5cm) deep. If you're not familiar with these kinds of devices, you might think that operating and utilising it could prove to be a bit of a challenge. 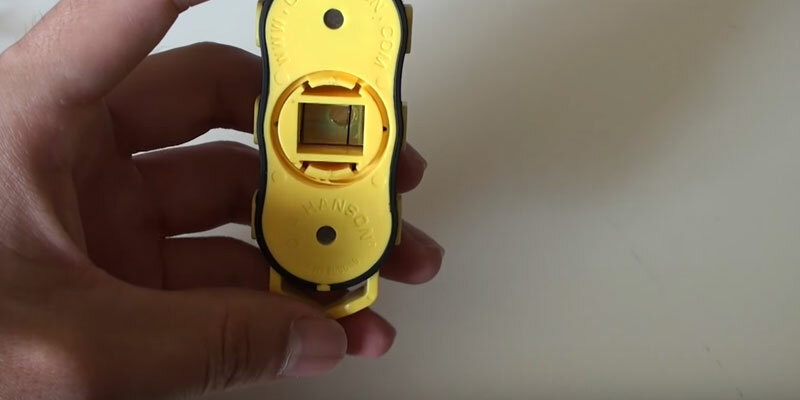 While we won't be able to deny this sort of allegation when it comes to every single stud finder out there, this particular one is as user-friendly as it gets. The mode comes equipped with no more than three buttons and the first thing you will have to do is select the probe type, then you should press and hold the push button until it starts making sounds, and all that is left to do is scan horizontally across the object surface. A graphical liquid-crystal display and continuous beeping sounds are there in order to help you find out the stud's location. If you are completely sure that there are lines in a specific location, but don't seem to be able to find them with the sensor in "AC" mode, then you ought to simply switch to the metal mode since electrical lines are often shielded by metal cladding. Add to that the fact that the device is equipped with an auto-off function that turns it off after 60 seconds of no use and we would be unwise not to recommend this device to those customers that are looking for a versatile and convenient stud finder. Nowadays, you can find a lot of tools for home renovations that simplify this work dramatically. 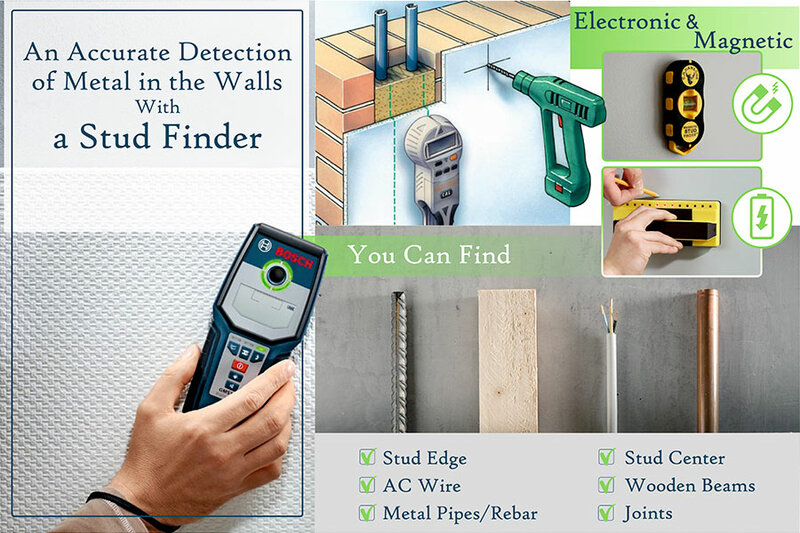 One of them is a stud finder and its main purpose is to detect the framing studs located behind a wall surface. 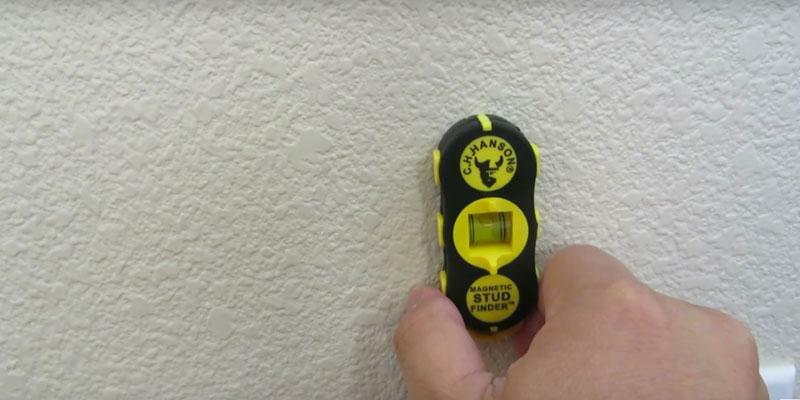 That's why a stud finder is an indispensable tool for those who need to drill holes in dry walls or particleboards and hammer nails or drive screws directly into a vertical metal or timber stud. Of course, if you are a seasoned builder, you can detect hollows in a wall by simply tapping on it. However, we think that finding studs with a specialized device is much easier. What's more, it will help you detect the electrical wires behind the walls and thus, avoid electric shocks and short circuits. 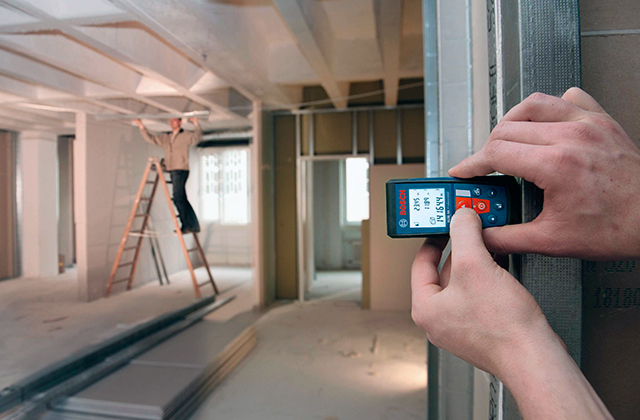 You can choose one of two different types of stud finders for home or professional use: electronic and magnetic. Both of them will help you find studs each in its own way, though. As the name suggests, a magnetic tool uses magnets to locate metal in the walling material (screws and nails) while an electric one measures the wall density in order to detect studs. The finders can be equipped with a display that shows a frame layout or LEDs that light up, indicating studs. 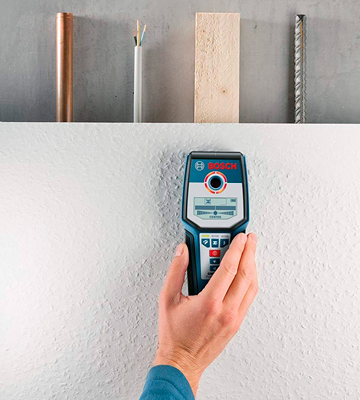 The choice of a stud finder depends on your preferences only, so read our review on 5 best models available in the market and make the right choice. 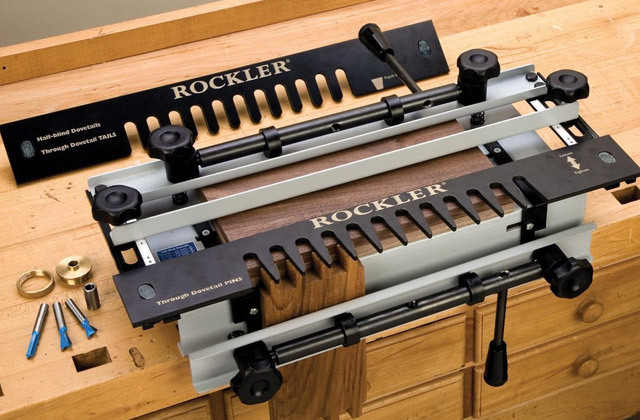 If you are renovating your home now it is high-time to level up your toolbox with new instruments for extra convenience. 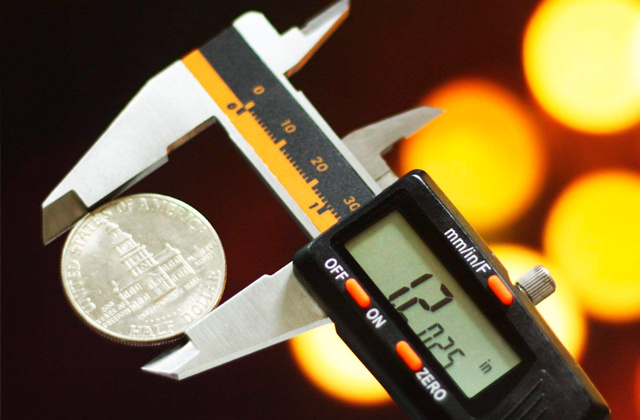 First of all, consider a laser level to align and balance every item in your house and then get rid of your old measuring tape since laser meters are more convenient and feature the whooping measuring distance up to 300 ft! Finders for detecting hidden objects in walls can be both electronic and mechanical. 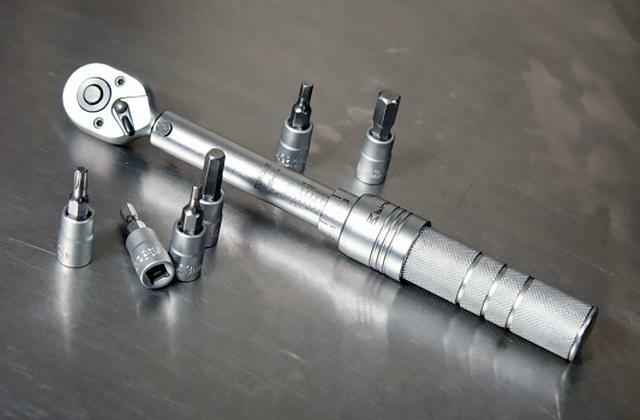 In case of mechanical finders, their type implies a complete absence of electronic parts and availability of one or more magnets as operating components in their design. As for electronic models, they are equipped with special sensors that detect changes of dielectric permeability or dielectric capacitivity of a wall, as well as electric field intensity changes. 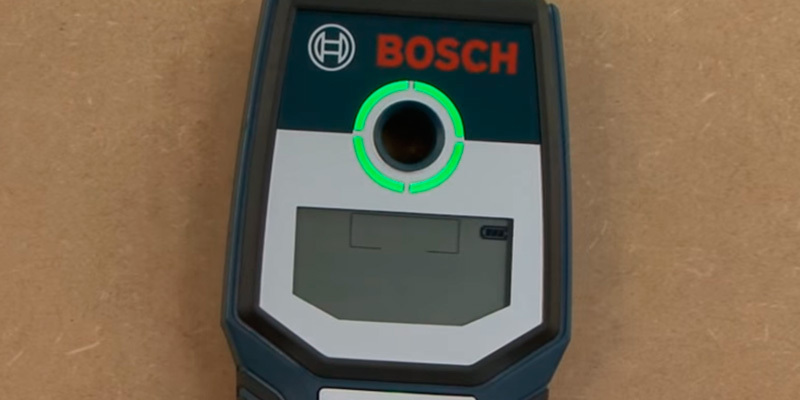 The information about objects located in such a way is displayed on the screen, and for the stud finder models with a simpler design, it will be displayed using conventional LEDs. Thus, you can not only determine an object location but also determine its width. Naturally, the operation of these electronic detecting devices requires an electric power, for which an AA or nine-volt battery, as a rule, is used. Depending on the finder type types of objects that you can find with it may also be different. For example, mechanical models can easily detect metal objects in walls, with that these finders are not capable of detecting objects at the depth of more than 3/4 inches, as a rule. At this point, the possibilities of mechanical detectors are exhausted, thus if you need a device with wider possibilities then electronic models are the option.Some models with built-in sensors and scanners can easily detect not only metalware and metal profiles inside walls but also hidden wiring (live and dead) and even gas or water pipes - at the depth of 4 inches or more. It is natural that each manufacturer tries to make its product easier to use by implementing certain features. For example, some models can not only show information about the object found on the display but also notify the user with a sound signal. Other models may feature special pointers to the location of a hidden object, which make it easier for you to mark the object location with a pencil or a marker pen. It is also worth noting that most electronic models have several modes for detecting specific types of objects with each type displayed on the screen as a corresponding icon. Such indication greatly simplifies the use of the detector. If you have to work in low light conditions often we recommend choosing a model with a backlight that will make reading the info on the display much more convenient. When considering an electronic detector model, it is advisable to learn what kind of batteries and how many are used for the device operation. From or experience, replacing a set of four AA batteries is easier and cheaper than replacing the same number of nine-volt batteries. Eventually, do not forget to check the detector weight as you may have to carry it in the pocket of your shirt or pants, in which case every extra ounce will bring discomfort. 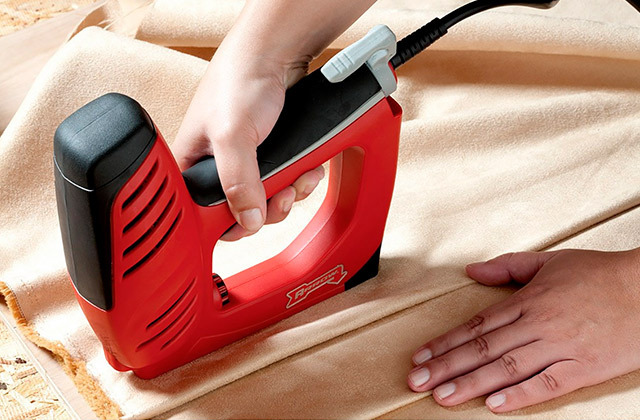 Q: What is the difference between various stud finders that are available for purchase? A: With various stud finders available today, most of them refer to two main types: magnetic and electric stud finders. While magnetic finders use stationary or moving magnets to detect metal objects, the electric or electronic ones use special sensors that detect changes in the dielectric constant of the wall. Based on this principle, electric stud finders determine changes in dielectric constant when you sweep the sensor over a fastener or a stud. With that, lower dielectric constant readings indicate the presence of a stud or other metal object in the wall. Some finder devices combine both magnetic and electric technologies. However, there are newer technologies implemented in some finders, such as the use of RF radars with 3D imaging technology. Q: Do magnetic stud finders differ from each other? A: While all magnetic finders share the same principle of operation, which is the attraction of the magnet or magnets to metal objects in the wall, the implementations differ. There are magnetic finders that have secured magnets that do not move inside the finder and there are models with a magnet suspended in an enclosure inside the device case and is free to move in response to in-wall metal objects. 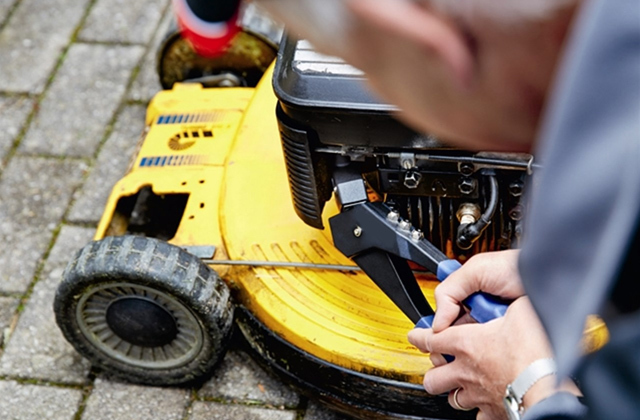 Q: Is there a difference between the electric finders? A: The electric stud finders can be divided into three main categories: edge finders, centre finders, instant finders. 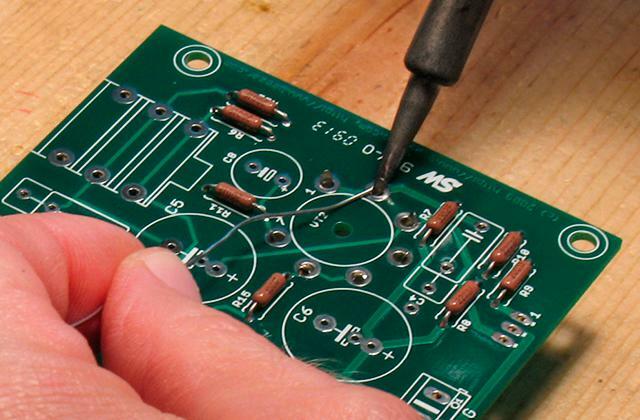 Being the most basic internal capacitor detectors, edge finders detect edges of a stud or other materials. Center stud finders usually use two sensors for registering separate readings of a dielectric constant of the wall to detect the stud centre. The most cutting-edge devices, instant stud finders, are equipped with multiple sensor plates and special algorithms for processing the sensor readings, which eliminate the need for the user to sweep them across the wall. Q: What objects can I locate using a stud finder? A: As we mentioned, the primary function of a stud finder is to detect studs, fasteners and metalware in the wall. 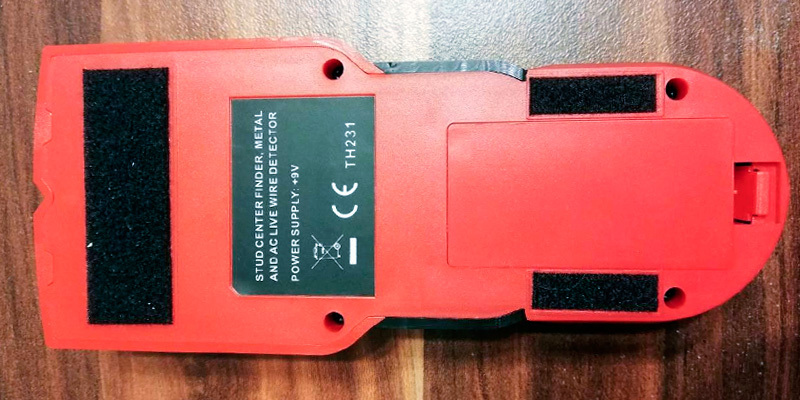 Though magnetic stud finders are designed to locate such object, electric finders may offer a wider range of detectable objects. Depending on the type of sensors used, electric finders are capable of locating wood beams and structures as well as live AC wires in the wall. 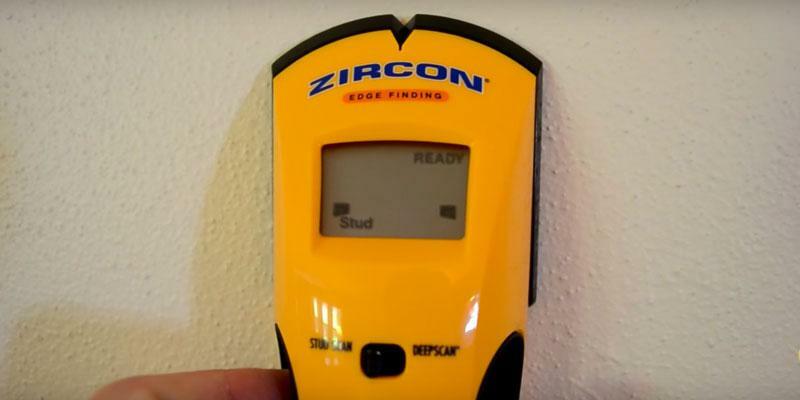 Q: Do I need to have any special skills to use a stud finder? A: No, using a stud finder does not require any special skills. However, using magnetic models may require more effort in determining the location of in-wall objects due to its simple principle and comparatively small range of operation. 1. Stud Finder Buying Guide, eBay. September 16, 2013. 2. How to Use a Stud Finder to Find Stud Joists Through Carpet, DoItYourself. 3. How to Find a Stud, wikiHow. 4. Stud finder, Wikipedia. February 20, 2017. 5. Bob Formisano Stud Finders: What You Need to Know, The Spruce. May 26, 2016. 6. Steffani Cameron How To: Use a Stud Finder, bob vila. 8. Lee Wallender Six Ways Find a Stud in a Wall, The Spruce. March 1, 2017.